Ganeysh. D. Saive, an alumni of B. Pharm 2008 batch, currently with GSK Pharma as Senior Executive - Anti Bribery Anti Corruption (ABAC) Associate. 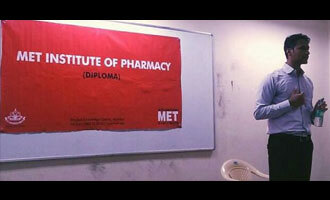 Ganeysh delivered a guest lecture for MET IOP’s D. Pharm. students, recently. It was homecoming for him. His interaction with faculty, staff and students left everyone inspired.